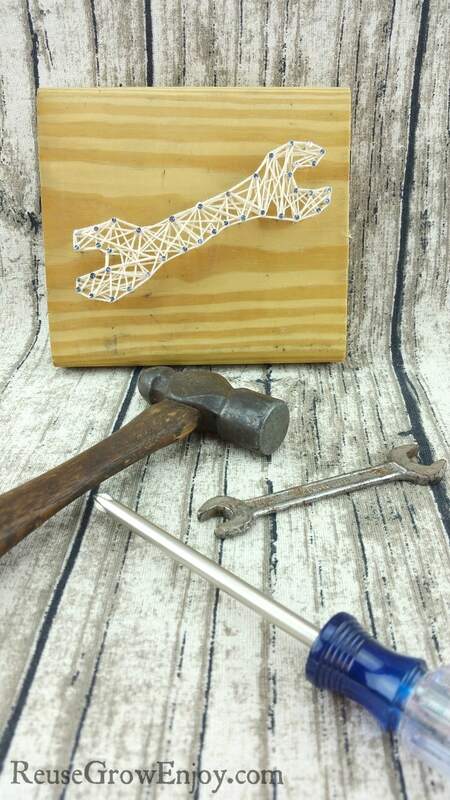 Have you ever tried to make your own string art? It really is pretty easy! If you stick to simple pictures without too much detail, pretty much anyone can do them. 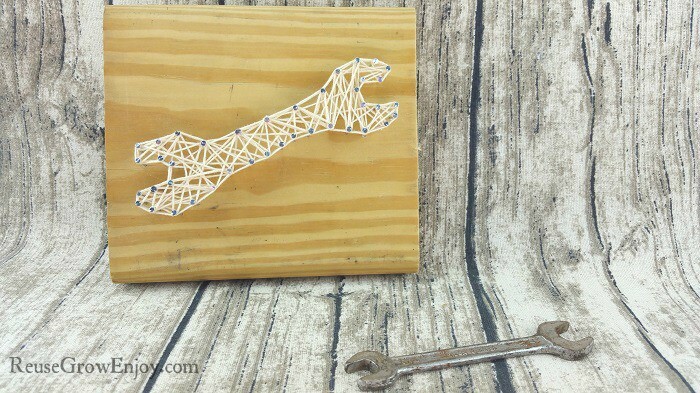 I am going to show you how to make this DIY wrench string art! It is great for a man cave, garage, shop or even just as a nice gift for your husband or dad. Plus it is super cheap to make! I already had some scrap wood from another project so I just used that. It was 6-inch x 5 1/2 inch. But you can either cut a small piece or just use what you have on hand. You can pretty much make anything that is at least five inches wide work. Fist thing you want to do cut the paper down so that it fits on your board. You can just carefully rip it by hand. 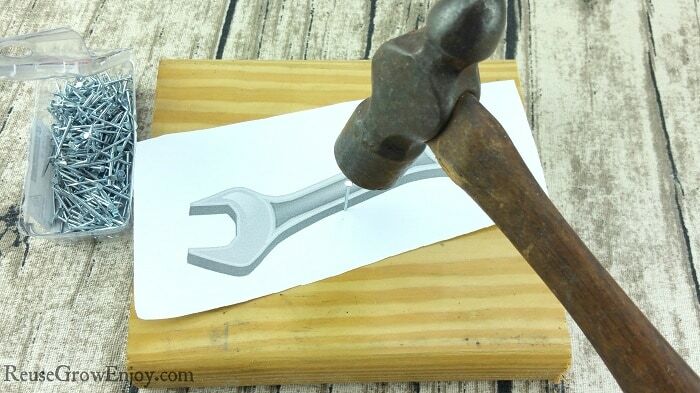 Then start hammering nails around the outer edge of the printed wrench. 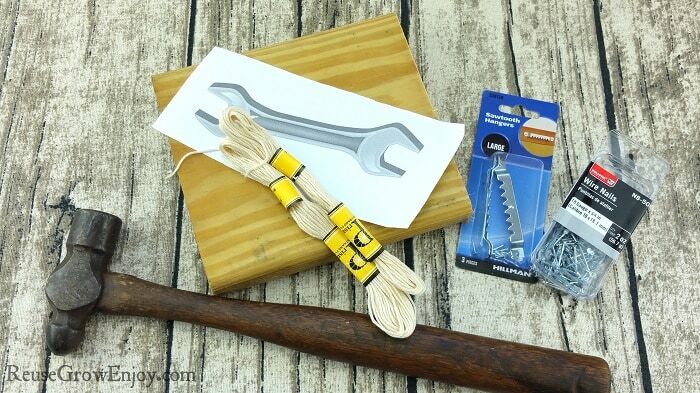 Be sure to only hammer them in about half way as you want part of the nail to stay sticking out. Also be sure to try and keep each nail about the same height. Next, loop a small knot at one end of your string. Hook it over the end of one of the nails. Then slowly start wrapping it around the top of each nail until you have made your way all the way around and have an outer border line. 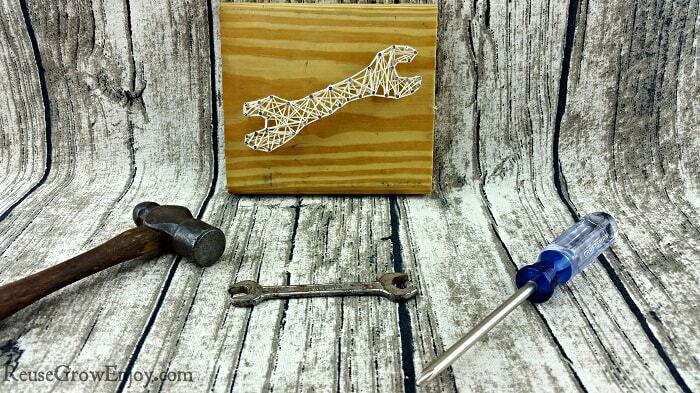 Now go back and work an up and down and side to side filling in the center of the wrench string art. After you have it fully covered, you can tie the string off around a nail and trim off any extra. Next, you will carefully remove the paper from around the nails. You can either display it like this on a table or shelf, or you can add a hanger on the back to put it on the wall. If you are adding a hanger, be careful not to push your string art nails in anymore. You can do this by flipping it over to the edge is on a board or something hard to keep the pressure off the nails. 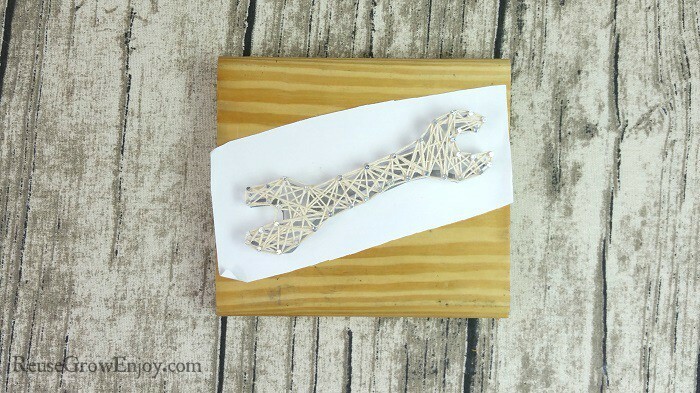 If you liked this DIY wrench string art craft, here are a few more crafts to take a look at.